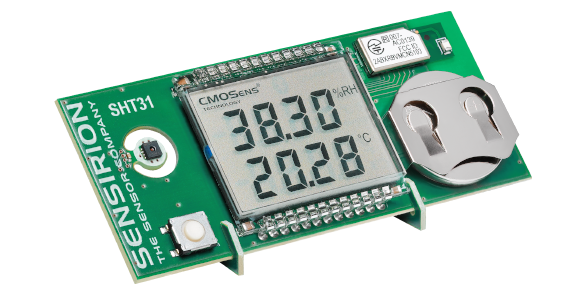 Order your SHT31 Smart Gadget Development Kit via Mouser Electronics or DigiKey now. 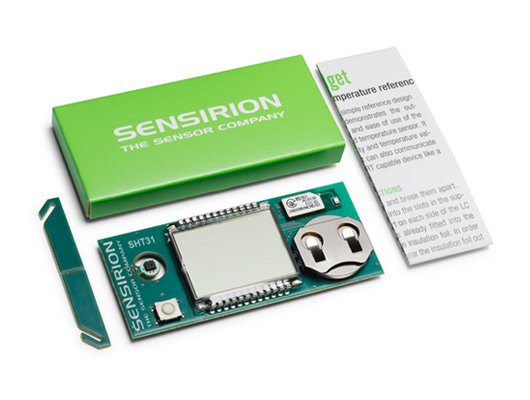 The Sensirion Smart Gadget example app allows you to connect wirelessly via Bluetooth Low Energy (BLE) to your Sensirion Smart Gadget. 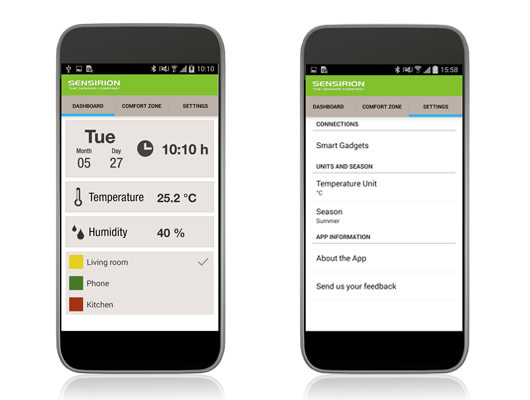 The example app displays the current temperature and relative humidity values measured by the Sensirion SHTC1 & SHT31 sensor on the Smart Gadget and allows the download of logged data. Enable BLE on Smart Gadget: Press button on Smart Gadget for 1 second. Connect to Smart Gadget: Go to settings to see the list of Smart Gadgets available for connection. Tap on a Smart Gadget in the list to connect and view the Smart Gadget's details page. Live values are displayed in the dashboard and comfort zone views. Enable logging on Smart Gadget: Go to the Smart Gadget's details page to set a logging interval and enable logging. 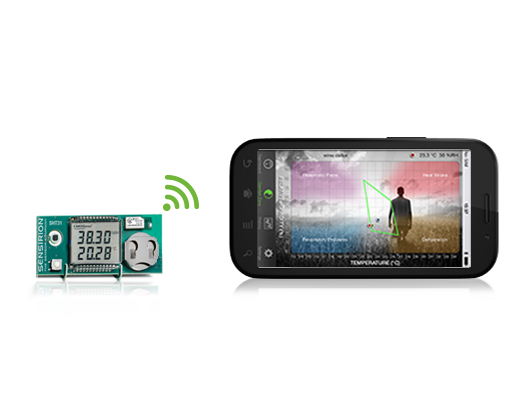 Measurement data is stored on the Smart Gadget's memory. Download data from Smart Gadget: Go to the Smart Gadget's details view to download and store measurement data from the Smart Gadget's memory to your mobile device. Downloaded data can be viewed in the History view. In the Smart Gadget details page you can enter a custom name for your Smart Gadget. 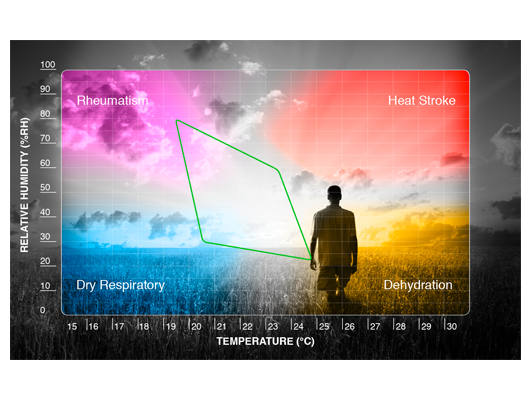 Physical values displayed in the dashboard and history views can be chosen from humidity, temperature and dew point. The Smart Gadget can store up to 16'000 value pairs (RH and T) which corresponds to a duration of 4.5 hours for 1 second logging interval and 5.5 years for 3 hours logging interval. When the Smart Gadget's memory is full, the oldest values are simply replaced with the newest ones. Once enabled, logging stays active also when the BLE connection is lost or BLE is disabled on the Smart Gadget. Depending on the amount of data stored on your Smart Gadget, downloading may take a while (up to 10 min. for a full memory). 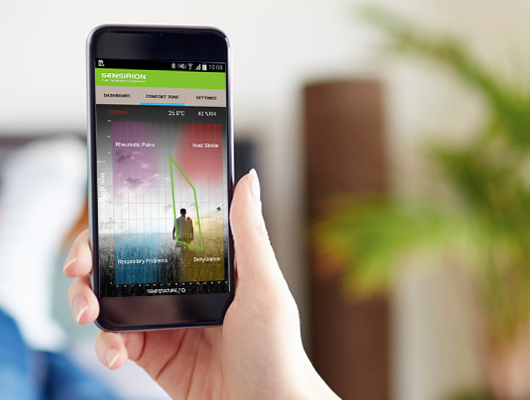 Disabling logging or changing the logging interval discards the data stored on the Smart Gadget. Data which was already downloaded to your mobile device is not affected. Deleting the data on your mobile device takes no action on the data stored on your Smart Gadget.